In “Message to My Seventeen-Year-Old Self,” Roberto Martínez, a California Correctional inmate, writes that he wishes he would have taken school more seriously. “Prison ain’t anything like the thug life lies romanticize it to be; it doesn’t make you a man.” In this compelling collection of first-person testimonials—essays, poetry and letters—Latino men and boys who have been or are incarcerated write movingly about their past and future. Acclaimed author and former gang member Luis J. Rodríguez writes in his foreword that the disproportionate number of young men of color in the justice system is rooted in economic, political and historical factors. He asserts that the United States’ punitive laws and practices—including three-strike laws, gang and gun enhancements, zero tolerance and school removals—have fueled a massive prison industrial complex, and ultimately, more gangs and violence. 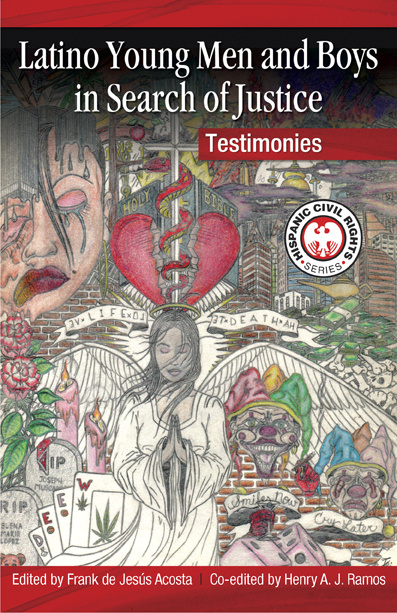 With the publication of this collection of first-person testimony and articles by system reform advocates, editors Frank de Jesús Acosta and Henry A.J. Ramos seek to humanize disadvantaged Latino young men and call attention to the need for a restorative rather than punitive justice system. This volume confirms that—for both the Latino community and the country as a whole—the “school-to-prison pipeline” must be closed now. Click here to listen to an interview with Frank de Jesús Acosta about Latino Young Men and Boys in Search of Justice: Testimonies. Click here to listen to an interview with Henry A. J. Ramos about Latino Young Men and Boys in Search of Justice: Testimonies. FRANK DE JESÚS ACOSTA is principal of Acosta & Associates, a California-based consulting group that specializes in professional support services for public and private social change ventures in the areas of children, youth and family services, violence prevention, community development and cultural fluency. He is the author of The History of Barrios Unidos (Arte Público Press, 2007). HENRY A. J. RAMOS is the author of Democracy and the Next American Economy: Where Prosperity Meets Justice (Arte Público Press, 2019), The American GI Forum: In Pursuit of the Dream, 1948-1983 (Arte Público Press, 1998), Nuevos Senderos: Reflections on Hispanics and Philanthropy (Arte Público Press, 1999) and Opening Doors: Pathways to Diverse Donors (Jossey-Bass, 2002). He co-edited, with Frank de Jesús Acosta, Latino Young Men and Boys in Search of Justice: Testimonies (Arte Público Press, 2016) and Overcoming Disparity: Latino Young Men and Boys (Arte Público Press, 2016).